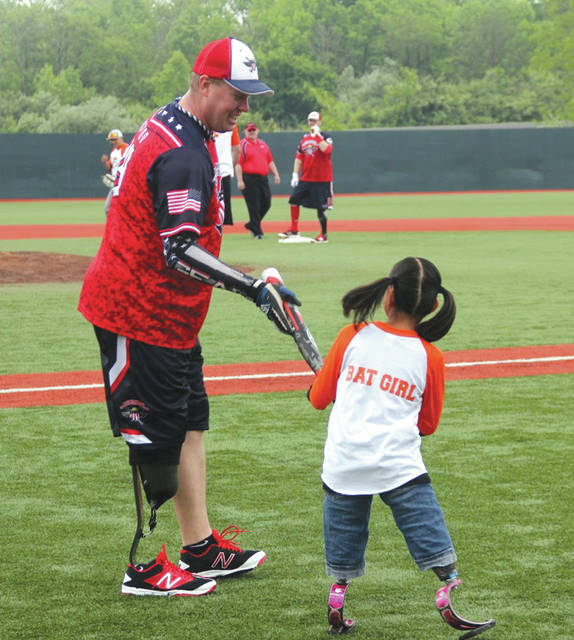 A member of the nationally known Wounded Warrior Amputee Softball Team hands his bat to a guest amputee bat girl during a recent charity softball game. The Wounded Warrior team will play a pair of exhibition games Saturday, Oct. 13 at Wright State University’s Nischwitz Stadium. FAIRBORN — For the third consecutive year, the nationally known Wounded Warrior Amputee Softball Team (WWAST) will play an exhibition softball game at Wright State University’s Nischwitz Stadium. In fact, they’ll play two. On Saturday, Oct. 13, WWAST will take on two teams of able-bodied softball players for a pair of games at Nischwitz. At 9 a.m., the Wounded Warrior team will play a group of local military and first responder all stars. The second game is set for 2 p.m. with the WWAST players taking on the Dayton Legends Softball Club All Stars. Between games, a special ceremony will honor area families who have lost a loved one with a special “WWAST Salute to Gold Star Families,” which is scheduled to begin at 11 a.m. Recognition of the event’s beneficiaries — Fisher House, Honor Flight-Dayton, the WSU Veteran & Military Center, and the Dayton VA Medical Center —will also take place during this time. The Dayton Warriors Softball Fund, an all-volunteer fundraising group for Miami Valley veteran’s causes, is hosting the Wounded Warrior team. In the past, the Wounded Warriors helped raise money for Fisher Houses, Inc., Honor Flight-Dayton, and they raised funds to send a local amputee child to the WWAST’s Kids Camp. The Wounded Warrior team is playing games in Madison, Ala. and Welch, Minn. this week. They’ll be in Adrian, Mich. later this month. In June, the group hosted its annual Kids Camp for 20 kids with amputations, ages 8-12, in Manchester, N.H. The team plans a western swing of charity games in Arizona and California in November. For more information please write to: dayton_softball@hotmail.com. Tax-deductible donations to the Wounded Warrior team can be made at www.thewwast.org . https://www.fairborndailyherald.com/wp-content/uploads/sites/50/2018/09/web1_WWASTBatGirl_PS.jpgA member of the nationally known Wounded Warrior Amputee Softball Team hands his bat to a guest amputee bat girl during a recent charity softball game. The Wounded Warrior team will play a pair of exhibition games Saturday, Oct. 13 at Wright State University’s Nischwitz Stadium. Contact John Bombatch at 937-372-4444, Ext. 2123. For more information about the upcoming Wounded Warrior Amputee Softball games, visit the Dayton-area Facebook page at: Facebook.com/WoundedWarriorsSoftballInDayton.